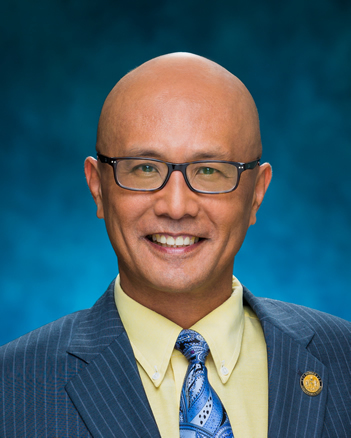 Senator Will Espero represents the 19th Senate District, which encompasses ‘Ewa Beach, Ocean Pointe, ‘Ewa by Gentry, Iroquois Pointe, and a portion of ‘Ewa Villages. He currently serves as the Chair of the Public Safety, Intergovernmental, and Military Affairs Committee, and as a member of the Committees on Transportation and International Affairs, and Ways and Means. He also serves as Majority Floor Leader. Senator Espero was recently appointed to the Clean & Sober Homes and Halfway House Task Force, the Steering Committee of the Justice Reinvestment Initiative, the Government Contracting Task Force, and on the Board of Directors of the Friends of the Hawaii State Art Museum. Senator Espero is a member of the Oahu Metropolitan Planning Organization, which coordinates federally funded transportation projects for Oahu. He is also a Board member of the West Oahu Economic Development Association, Workforce Development Council, the Interstate Commission for Adult Offender Supervision, Corrections Population Management Commission, Re-entry Collaborative Steering Committee, and Operation Homefront of Hawaii. Born on November 6, 1960, Senator Espero was born at the U.S. Naval Base in Yokosuka, Japan. His mother is from Santiago, Ilocos Sur, and his father is from Bacnotan, La Union, in the Philippines. He graduated from Seattle University in Washington with a B.A. in Business Administration in 1982. Governor Neil Abercrombie today signed into law a measure to promote gun safety and enhance registration requirements for firearms brought into Hawaii. Senate Bill 69, relating to firearms, closes a loophole in Hawaii's firearms law by requiring individuals who bring into Hawaii firearms produced outside of the State to undergo a background check. "With the recent shootings in Aurora, Colorado and Newton, Connecticut, gun violence has been thrust into the forefront of many discussions across the country, including here in Hawaii," said Senator Will Espero, who introduced the measure and chairs the Senate Committee on Public Safety, Intergovernmental and Military Affairs. "This measure promotes gun safety by strengthening Hawaii's firearm registration requirements and ensuring that individuals bringing firearms into our State are receiving proper background checks." Under Hawaii's previous law, a person arriving in the State with a firearm was required to register the firearm, but no permit process or background check was required. This created a loophole which allowed individuals who might have been prohibited from acquiring a firearm in Hawaii the ability to acquire a firearm outside of this State, where a permit process or extensive background check may not be required, then possess and be considered a registered firearm owners after registering with the county police department. SB 69, requires county police departments under certain conditions to fingerprint, photograph and perform background checks on individuals who wish to register a firearm that was procured out-of-state. The measure also authorizes the police departments to assess a fee for conducting a fingerprint check and specifies the amount of the fee. Additionally, it extends the time period for registering a firearm procured out-of-state for consistency with the time period for registering firearms obtained in or imported into the State. 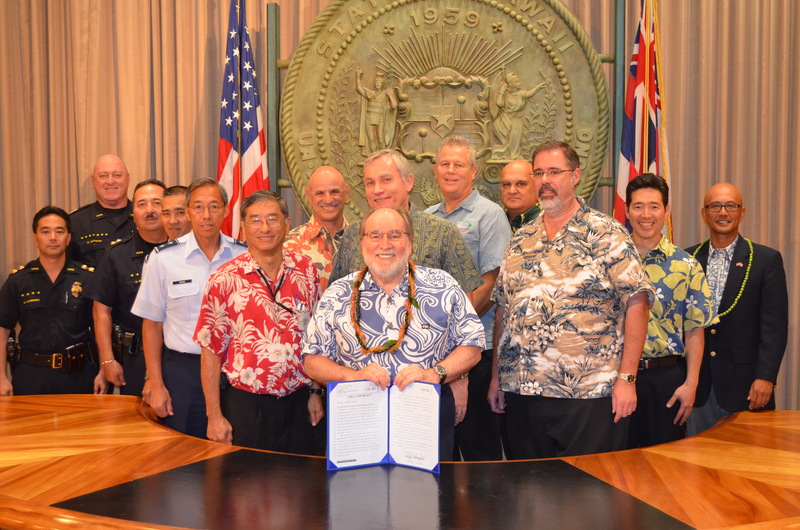 Governor Neil Abercrombie signed into law today a measure aimed at strengthening homeland security in the State of Hawaii. Senate Bill 680 enacts a homeland security law to establish a State Homeland Security Office within the Department of Defense and authorize the establishment of county organizations for homeland security. "Hawaii's geographic location makes us vulnerable to homeland security threats," said Senator Will Espero, who introduced the bill and chairs the Senate Committee on Public Safety, Intergovernmental and Military Affairs. "By establishing a Homeland Security Office within the State, this measure demonstrates Hawaii's commitment to ensure the continued safety of our citizens and visitors. The recent incident in Boston shows the need for local jurisdictions to be very attentive and take the initiative on security issues. " "Currently, the main focus of the State Department of Defense is mostly civil defense or emergency preparedness and the National Guard," Espero explained. "The new office will complement the Federal Department of Homeland Security, providing a comprehensive program to help protect Hawaii's residents, infrastructure and government from terrorism and other attacks." Under the law, the adjutant general will serve as the director of the State Homeland Security Office. The office is tasked to prepare comprehensive plans and programs for homeland security and homeland defense, conduct studies and surveys of the vulnerabilities of critical infrastructure and other tasks. View the media release. Senator Will Espero joins the Governor for the signing of Senate Bill 680, relating to homeland security. In light of what is currently occurring in the local "Booting" industry, Senator Will Espero will introduce legislation next session to regulate and allow booting. If passed, the legislation will allow booting of vehicles once strict rules are adopted by the Department of Commerce and Consumer Affairs following public comments. Currently, Senate Bill 1214, to ban booting, is before the Governor, and a state Office of Consumer Protection lawsuit is also being heard in the courts to stop current booting. Senator Espero believes booting can be less expensive and more convenient for drivers versus being towed and having the added expense and time involved. "I have no problem placing a cap on the amount a person can be charged after being booted," said Senator Espero, who represents District 19 ('Ewa Beach, Ocean Pointe, 'Ewa by Gentry, Iroquois Point, portion of 'Ewa Villages). "The idea of being booted and towed should also be discussed and possibly banned since this would be a double hit on a driver."  A cap of $25-$50 for unlocking a boot. For more info, please call Will Espero at 586-6360. The Hawaii State Senate will commemorate Hilo Hattie's 50th anniversary on Friday, April 5, 2013 during its Session, which begins at 11:30 a.m. Senators will present the company's top executives with a Certificate of Recognition for achieving this milestone. "It is important for us to recognize Hilo Hattie for this significant achievement. Through its products, the company has shared what's unique to our Islands and the Aloha spirit with visitors and kamaaina alike," said Sen. Will Espero, who will be presenting the certificate. Hilo Hattie's history in Hawaii began in 1965 when the first manufacturing center, named "Hawaiian Wear Unlimited," opened in Honolulu. In 1979, the company officially changed its named to Hilo Hattie Fashion Center, named after the entertainer, Ms. Hilo Hattie. Its new headquarters and flagship store on Nimitz Highway opened in 1983. The Hawaii Visitors and Convention Bureau awarded Hilo Hattie the Kahili Award for "The Best Retailer in Hawaii" in 1998. The Guinness Book of World Records certified Hilo Hattie's 400XL Aloha Shirt as the "World's Largest Aloha Shirt" in 1999. Among its most recent accolades, The Star Advertiser, Honolulu Magazine, and Hawaii Business Magazine all voted Hilo Hattie "The Best Place for Aloha Wear." Members of the Tuskagee Airmen will be honored by the Hawaii State Senate during its floor session on Friday, March 1, 2013 at 11:30 a.m. The Tuskagee Airmen are members of the 332d Fighter Group and 477th Bombardment Group that flew missions from Sicily to Normandy during World War II. The Tuskagee Airmen are also the only African American pilots who served in combat. Hawaii residents Romaine Goldsborough and Philip Baham, along with Alexander Jefferson of Michigan, will be presented a Certificate of Recognition from the Senate. Romaine Goldsborough will be represented by his wife at the presentation. "Now in their twilight years, it is important that we show these American heroes how much we appreciate the sacrifices they made for our country and their contributions to our nation's history," said Senator Will Espero, chair of the Senate Committee Public Safety, Intergovernmental and Military Affairs. While facing much adversity and limited opportunities, African Americans were barred from flying for the U.S. military prior to 1940. These barriers neared an end when civil rights groups and the press exerted enough pressure for an all African American pursuit squadron formed in Tuskegee, Alabama in 1941. The Tuskegee Airmen overcame segregation and racial prejudice and became one of the most highly respected fighter groups of World War II. Their awards and decorations include three Distinguished Unit Citations, 14 Bronze Stars, and eight Purple Hearts. These achievements and commendations paved the way for full integration of African Americans in the U.S. military. The issue of gun control continues to be debated at the national, state, and city level. With the recent shootings in Aurora, Colorado and Newton, Connecticut, gun violence has been thrust into the forefront of many discussions across the country, including here in Hawaii. Senator Will Espero, who introduced a measure to curb gun violence through the creation of a gun buy-back program, discusses the bill, Senate Bill 69, Relating to Firearms. According to the bill, a gun buy-back program decreases the availability of guns in the community by providing cash incentives to gun possessors to forfeit their firearms. In December, a gun buy-back program in Los Angeles netted 2,037 firearms in a single day. The measure was heard yesterday by the Senate Committee on Public Safety, Intergovernmental and Military Affairs, which Espero serves as chair.